04:30:00 Makes 24 servings, 1 square (80 g) each. Makes 24 servings, 1 square (80 g) each. 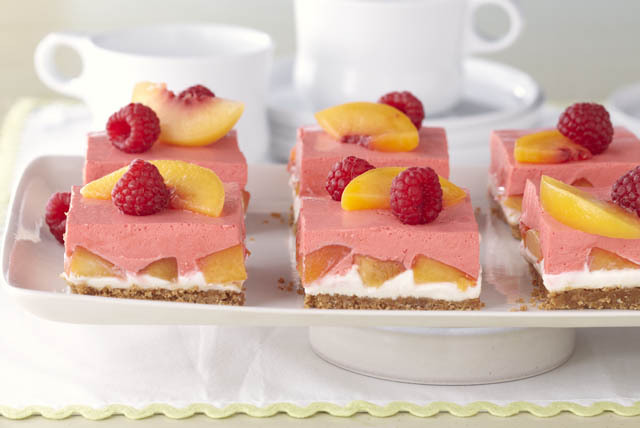 Peaches and raspberries shine in these creamy layered fruit squares. Fresh, fruity and fabulous, this easy dessert serves a crowd. Mix graham crumbs and butter in 13x9-inch pan; press onto bottom of pan. Beat cream cheese and sugar in medium bowl until well blended. Whisk in 1-1/2 cups Cool Whip; spread over crust. Top with peaches. Refrigerate until ready to use. Add boiling water to jelly powder in large bowl; stir 2 min. until completely dissolved. Stir in ice cubes until melted. Refrigerate 5 min. or until thickened. Whisk in remaining Cool Whip; spread over peach layer. Refrigerate 4 hours or until firm. Prepare using 4 small fresh peaches (1-1/4 lb./565 g). Serving Size Makes 24 servings, 1 square (80 g) each.